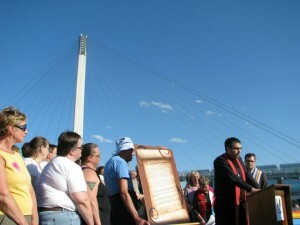 On Wednesday, June 15, a crowd of several hundred Omaha residents, and others coming from Crete to Des Moines, gathered at the Bob Kerrey Pedestrian Bridge for the public presentation and signing of the Heartland Proclamation. 194 Christian clergy have now signed onto this proclamation which declares that “homosexuality is not a sickness, not a choice, and not a sin” and calls for the full inclusion of lesbian, gay, bisexual, and transgender persons. 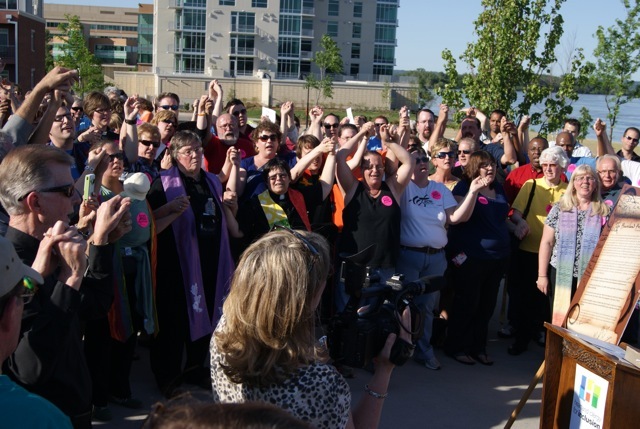 Fischer, who was born and raised in Omaha, said that he “grew up in a Christian faith that was not supportive of me or of other members of the LGBT community. “It makes me truly happy that the verdict is in, the silence has ended, and the intolerance, discrimination and suffering are over,” he said. The Heartland Proclamation was presented by Heartland Clergy for Inclusion, a group of Christian clergy in Omaha who have invited clergy from other Heartland states to join them in breaking their silence which has created “the impression that there is only one Christian perspective” concerning homosexuality. Recognizing the unique potential of the event to unite clergy and congregations throughout the Heartlands, the Rev. Dr. David Ruhe drove from Des Moines, IA, where he serves as Senior Minister of Plymouth Congregational United Church of Christ, to offer a response. “On behalf of clergy and congregations in Iowa and throughout the Heartland I am eager to affirm the Heartland Proclamation,” he said.